Kolkata - India started strongly in their second innings after Rangana Herath's defiant half-century gave Sri Lanka a handy 122-run lead on day four of the rain-hit opening Test on Sunday. The hosts were 70 for no loss at tea, trailing Sri Lanka by 52 runs at Kolkata's Eden Gardens. Openers Lokesh Rahul (36) and Shikhar Dhawan (33) were at the crease when tea was called. The left-right batting combination of Dhawan and Rahul handled the Sri Lankan pacemen with aplomb on a sunny afternoon -- a welcome change from the rainy start on the first two days. Earlier, it was Herath who lit up his team's chances with a defiant 67 -- his third Test fifty -- that steered the visitors to 294 in their first essay. The islanders, who started the day on 165-4 in response to India's 172, suffered a middle-order stutter before Herath put on stubborn partnerships against a persistent pace attack. 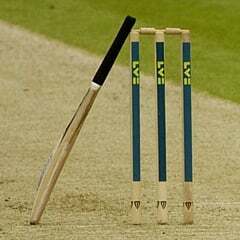 The left-handed Herath, Sri Lanka's premier spin bowler, showed great resolve during his knock which lasted 105 balls and included nine boundaries. He finally fell to paceman Bhuvneshwar Kumar after mistiming and slicing to deep point. Kumar and fellow quick Mohammed Shami claimed four wickets each. The visitors are seeking their first Test win on Indian soil in the three-match series.